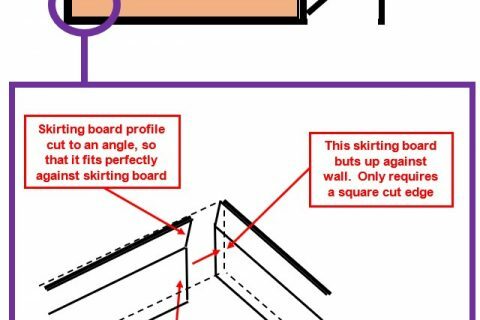 In order to get a perfect internal skirting board joint, you will need to learn how to scribe. 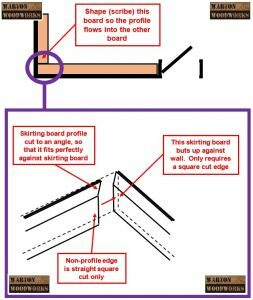 Some carpentry beginners may decide to mitre a skirting board internal corner, but this results in a join that does not look tight. 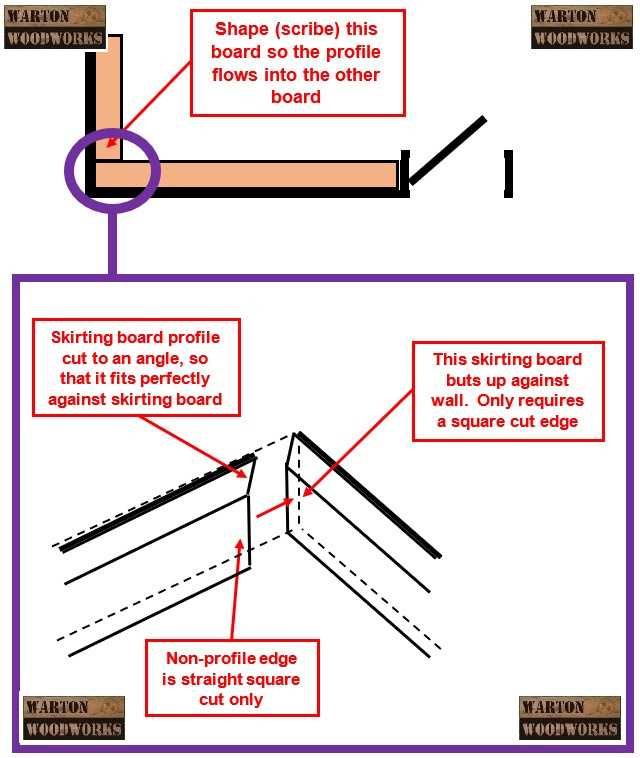 Scribe joints allow you to match up the exact profiles of the skirting boards. Below is an example of a scribe joint. You can learn step by step on how cut such a joint here. Sometimes you have to put a nail in places where you don’t want to see them. One of the best methods to hide nails is to make sure your nail heads are slightly beneath the wooden surface by hammering them in. 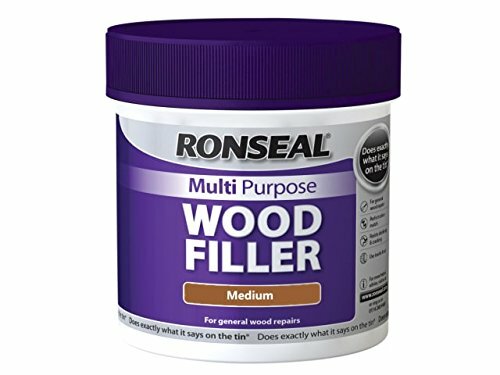 You can then hide your nail head by using a professional wood filler, such as the one below made by Ronseal. When it comes to carpentry tips, many would recommend a nail gun. Projects which involve a lot of nails can be tedious. Very large nails can be difficult to hammer in, and be prone to bending. 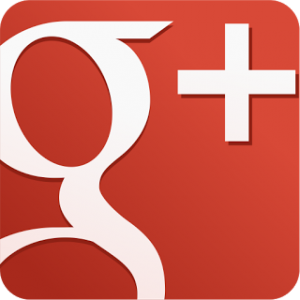 Nailing two pieces of wood together becomes more difficult in confined spaces or when angled. A good solution to this problem is to invest in a nail gun, this is probably one of our most valuable carpentry tips. 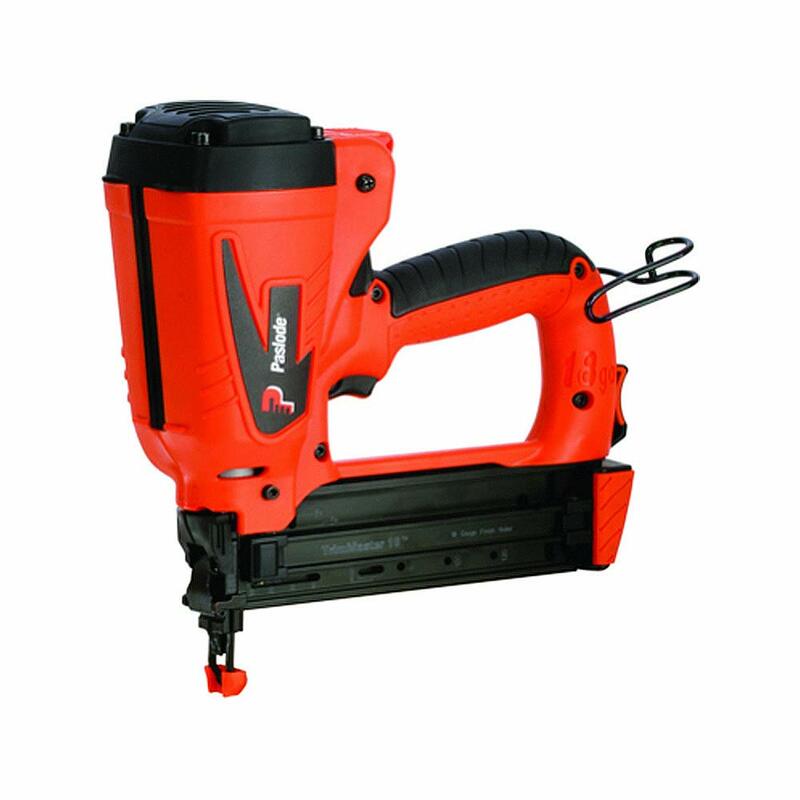 A Nail Gun is a tool which is used to drive a nail (brad) into another material. The tool using compressed air, explosive charge or flammable gases to propel the nail forward. Nails gun really do speed up work. You may want to consider the Paslode nail gun below, if you do not yet own one. In the heat of the moment it’s easy to forget measurements. Put masking tape on the side of your tape measure to jot down numbers. You’ll be glad you have those details when you get to the saw. This is probably one of the best carpentry tips. You see many people trying to remove nails with thick pliers. Pincers such as the one below are great for pulling nails. They are able to pull the nail from behind the head. They even have the ability to cut nail heads off. Make sure that you have a smoothed faced, 20 ounce hammer with a straight claw in your tool box. 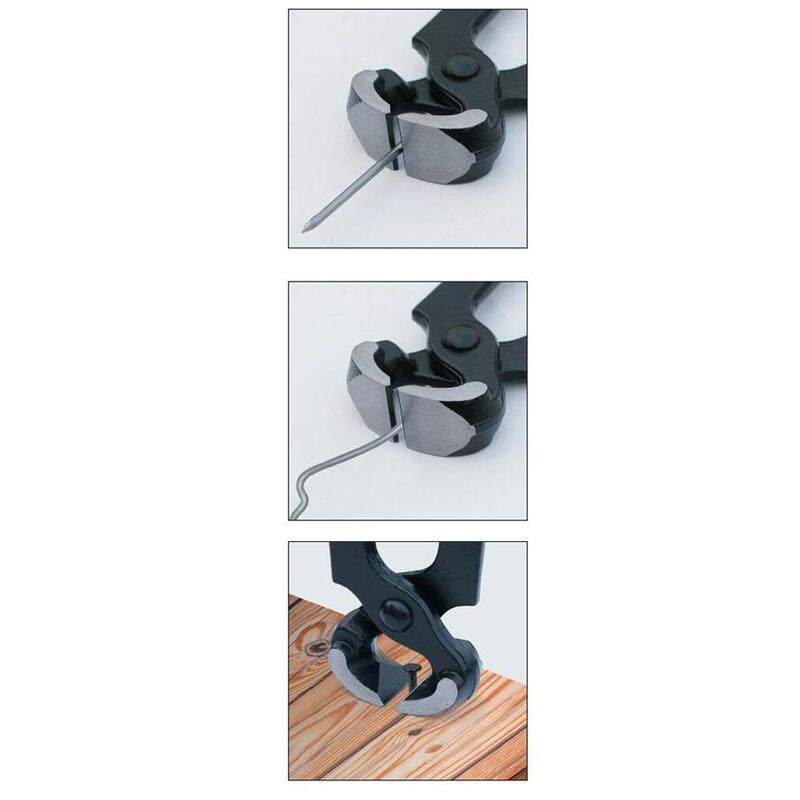 The claw is useful for many applications, such as lifting nails and frames. If you are a professional carpenter, then you will be measuring things everyday. Measuring up rooms with a tape measure can take a long time, and be awkward if the rooms are large. Laser tape measures can do the job so much quicker. With a simple click of a button they can measure the distance in meters or anything you choose. It works by sending out a pulse of laser light to a certain target, and then measures the amount of time it take the the light to reflect back. Laser tape measures provide extremely accurate readings. Some laser tape measures also have a range of other functions such as calculating area and volume. When doing carpentry it helps to know about different types of woodworking joints. Learning how to join two pieces of wood together is essential. There are different wood joins for all kinds of applications. Some have a purpose of making a structure more durable, whilst others are more focused on appearance. Visit this post to learn and master the different woodworking joints to take your carpentry projects to another level. When you are going to be staining wood make sure to go easy when gluing. Even if you wipe off excess glue it gets into the wood pores blocking the stain from penetrating. Even when following every health and safety rule, accidents still happen. It is best to be prepared if and when it does! You can buy simple medical boxes which contain all the essentials you need, such as wipes and plasters. The most common type of injury is a little cut to a finger. Even if the cut is not serious, blood gushing from your cut is a problem if you have nothing to wipe it away, or have no plasters available. 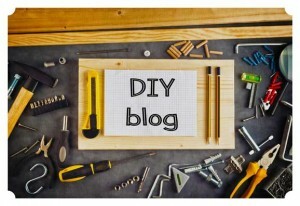 This article provides readers with 10 carpentry tips. Excellent for those who are beginning carpentry.